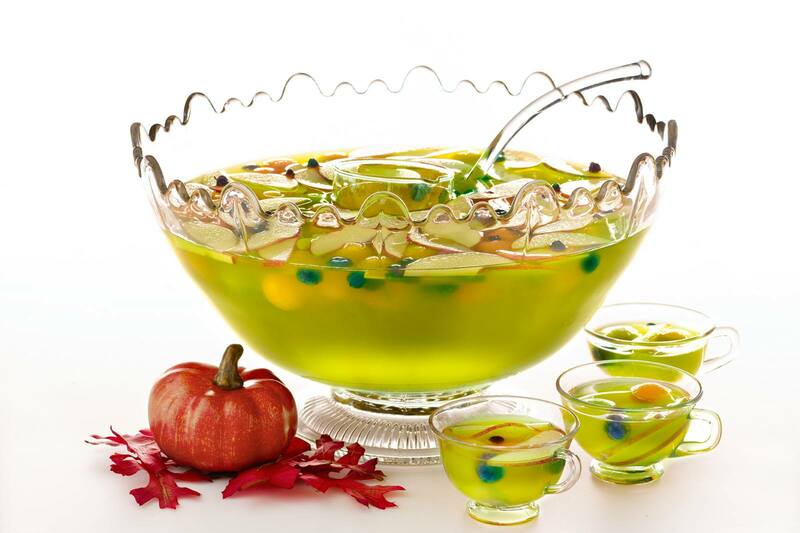 Halloween is a great excuse for a party and you can have a blast with a fun punch recipe. From spiked brews filled with rum to creepy garnishes that hide inside, there's a lot of opportunities to add a spook factor with a punch. You can take any punch recipe and add all sorts of weird and wacky things to give it that Halloween touch. Yet, there are a few recipes designed just for the holiday. Let's explore a few, including boozy punches for adults and a couple that ​is family-friendly. A brilliant green rum punch, this is a fun recipe that everyone will enjoy. The green glow is one that only Midori can bring to the table, so be sure to keep the other ingredients neutral in color. This is particularly true of the cranberry juice. How about a bowl of sangria for Halloween? The Bloody Rum Punch is a perfect choice and it's very easy to make. It's filled with rum and wine with just a hint of fruit and tastes great. The ruby-red drink is the perfect foundation for all your creepy additions. Throw in some dried ice to create a fog, cut the fruits in odd shapes to give it the look of a witch's brew, or float plastic spiders inside. When you need a booze-free punch for the party, few are as easy and delicious as this sherbet punch. It has a great green color and when ginger ale meets the sherbet, it also creates a fun, oozing foam. It's the perfect recipe for kids parties and those with non-drinking guests. Plus, with simple additions like dripping "blood" from grenadine, you can really add to the spook factor. You will have to increase the Devil's Punch to fit your party because it's written for a single drink. It would be best to ramp up the orange juice or add soda to knock back its strength, so your vampires don't turn into goblins by night's end. The mix is a devilish one and it's hard to resist when you have a house full of tequila fans. You might even think of it as an amplified Margarita. Ah, the Zombie Punch. It's been made so many times and in so many ways that we really cannot agree on the "correct" recipe, but it's long been a favorite for Halloween parties. Be warned, though, it has a lot of rum and may turn some guests into zombies. You want a spiked punch, but not one that's going to knock everyone down, right? Give this simplified Halloween sangria a try. The only alcohol is red wine, so it's significantly lighter than other options. Garnish ideas abound with this recipe, too. Have fun adding gummy worms and bugs or spooky candy or fruit eyeballs. Whatever you can hide inside is sure to add to the fright factor. This recipe has a super fun idea that you can actually add to any punch bowl. The jello brain is actually made with an ice mold (about the size of an ice ball). Have fun with it and add a few to the bowl. The punch itself is quite simple and because it's alcohol-free, it can work for any party. If you'd like to spike the fruity mix, a half bottle of rum should do the trick.